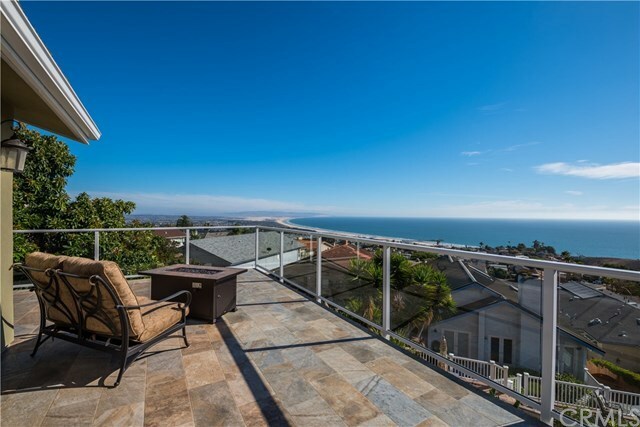 Presenting this beautiful custom home designed to frame point-to-point ocean views from Vandenburg to Port San Luis. Spread out over 3,122 square feet this multi-level home flows downhill, taking full advantage of panoramic ocean views from almost every room. At street level a 3 car garage with glass doors and a freshly poured seven car drive space will welcome guests and storage for all of your cars and toys. Down a few steps the main living level has a cozy solarium sitting area, large center island and chef's kitchen with granite counters and quality appliances plus formal dining that opens through bi-fold glass wall doors to a private deck. Drop down several stairs to a spacious great room framed on two sides with glass wall doors and punctuated with a cozy fireplace with marble surround. The next few steps down open to large guest beds -- one with it's own deck and side access -- and a shared bathroom with dual sinks. The final floor is a spacious master suite with corner fireplace and private downstairs patio entrance plus a massive bath with jetted tub opening to ocean views plus a two person double-head shower. Too many amenities to list: durable non-skid tile on patios with a slate look, all new windows, air conditioning, hand-scraped hardwood floors, enormous media room with storage for games or wine. Directions: Wadsworth until it turns into Longview -- take it almost all the way to the top -- on the left just before the one-way street.